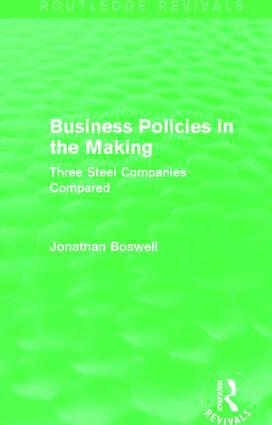 First published in 1983, this study investigates and compares three leading firms in the British iron and steel industry between 1914 and 1939, analysing their strategies, boardroom politics, and their responses to the problems posed by the Great War and by the vicissitudes of the 1920s and ‘30s. Jonathan Boswell illuminates certain issues that are of perennial importance for students of business: rationality and ‘error’ in decision-making, ethics, centralisation versus decentralisation, and the question of cyclical phases. The central theme throughout is the pursuit of three partly conflicting objectives: growth, efficiency and social action. The trade-offs between these three pursuits are used to examine significant contrasts in corporate strategies and behaviour, including towards government and public opinion. Boswell’s rejection of economic determinism; his insistence that managerial influences fall into definable long-run patterns; and his theses on managerial specialisation and long-term policy biases confront fundamental issues for theories of the firm.